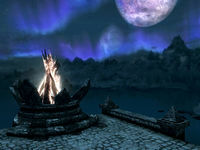 Solitude Lighthouse is a stone building on the northern coast of Skyrim that helps to guide ships into Solitude harbor. It is tended to by a Khajiit named Ma'zaka, who lives here alone. There are several spiky grass plants and a nirnroot nearby. The chest depicted in Treasure Map III is to the northeast, under the cliff edge. As you pass through the outer archway there is a door on your left that leads to the interior, which may be apprentice-locked. Continuing through the inner arch you come to a long spiral stone staircase that leads all the way up to the top and the fire that acts as the light for ships. Through the door on the left, you enter what appears to be a normal house, with barrels of foodstuffs on either side of you, with a wooden table further to the left against the south wall. On the table is a banded iron shield, an iron helmet, an iron war axe, a hunting bow, and a random sword. Against the west wall is a set of shelves holding several cheese wheels, two loaves of bread, a cabbage, and a potato. To the right is a fireplace with a cooking pot in front and a piece of raw beef and a cabbage in a cast iron pot on the hearth. To the right of the fireplace, coming out from the west wall is an internal wall. There is a plate holding grilled leeks on top of it, and a stack of two open crates on the floor beside it containing a sample of fly amanita, a gourd, a rock warbler egg and an orange dartwing, a sliced eidar cheese and two loaves of bread. Along the east wall are two stacked open crates containing a sample of fly amanita, a gourd, a rock warbler egg and an orange dartwing, three leeks and two potatoes. To the left of these is a set of shelves holding eight iron ingots, a piece of iron ore, a leather strip and a woodcutter's axe. Further to the left, still against the east wall are two more stacked crates containing a goat cheese wheel, a sliced goat cheese, a goat cheese wedge, six garlic bulbs, four tomatoes, and a cabbage. A small set of shelves next to these holds two potatoes, a portion of grilled leeks, two loaves of bread, a pheasant breast and a raw rabbit leg, a sliced eidar cheese and an eidar cheese wedge. Hanging above these are four rabbits, two salmon, and a pheasant. 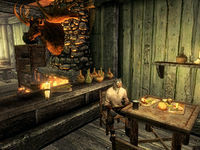 Behind the internal wall is a table and chairs set for two, with two portions of grilled leeks, two seared slaughterfish, a loaf of bread, an eidar cheese wedge, and a bulb of garlic. Above the table on the west wall is a wall shelf holding a bottle of alto wine. Against the north wall, next to the table, is a small set of shelves holding a copy of the Alteration skill book The Lunar Lorkhan. To the right of this is a doorway into Ma'zaka's bedroom, which consists of a single unowned bed with an end table holding a common book and a bottle of wine. There is a small coin purse beside the bed and an unlocked chest at the foot of the bed. On your right as you enter the room is a small unit holding a horker tusk, a cave bear pelt, a red mountain flower, and a basket containing two bunches of lavender. To the left in the northeast corner is a stack of barrels containing foodstuffs. A seemingly defined area stretching from the ship to the south up to just northwest of the lighthouse and east of the rocks may cause the game to crash upon entry. ? This page was last modified on 28 July 2017, at 05:10.